I have discussed heat with you a number of times so I thought it would be worthwhile to put the links to various blog posts all in one place for your easy reference. 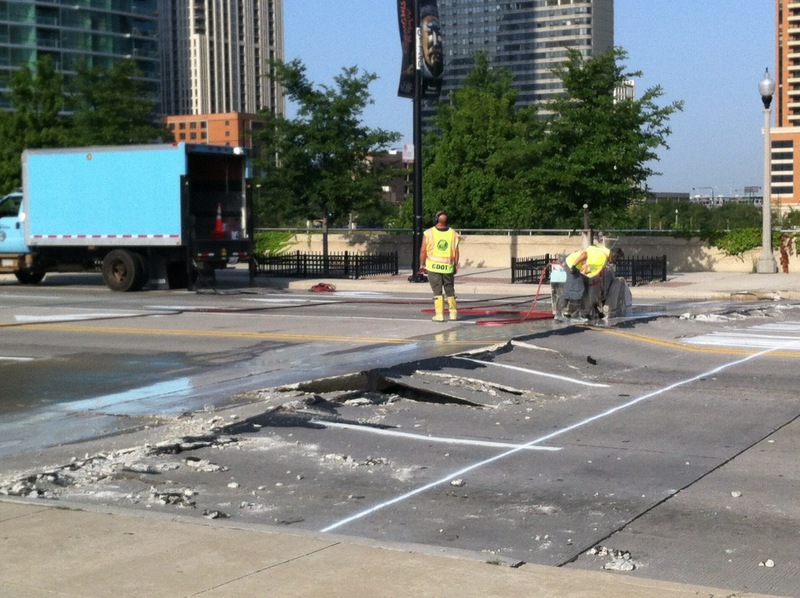 This is what the July heat wave did to Columbus Drive in Chicago a few years back. Think what it can do to your body. What Are Danger Signs During Hot Weather Exercise? How Dangerous is it to Exercise Outdoor in a Heat Wave? What About Bike Riding During a Heat Advisory? What to do About Exercise in Very Hot Weather? Important facts about skin cancer. “Heat-related illnesses and deaths are preventable. When extreme heat occurs, it’s important to be aware of those at greatest risk for experiencing its effects: the very young, the elderly, and people with chronic diseases and/or mental illness. Even young and healthy individuals, however, can succumb to heat if they take part in overly strenuous physical exercise outdoors during hot weather. People living in urban areas are at high risk also, thanks to the poor air quality of many large cities and often-stagnant atmospheric conditions, which trap pollutants in the air. When people breathe in these pollutants, they can trigger a wide range of respiratory problems. Asphalt and concrete also store heat longer and gradually release heat at night, leading to higher evening temperatures. Known as the urban “heat island” effect, this can prevent or reduce nighttime relief from extreme heat in a large city. In regions where low humidity is the norm, the body’s most common response to extreme heat is dehydration. When exposed to direct sunlight and temperatures higher than 90 degrees Fahrenheit, the body can lose as much as half a gallon of water every 10 minutes. This dehydration also can interfere with the body’s internal thermostat, leaving it vulnerable to heat-related illnesses such as severe sunburn, heat cramps, heat exhaustion and heat stroke. Last but not least lots of ice cream is eaten when it’s hot. I recommend watermelon instead. It is more cooling and refreshing and downright good for you. You can read our post How Healthy is Watermelon for more. Here is a healthy hot weather treat a made up for my dog that I enjoy, too. I do not know what You mean with extreme heat. What about Sauna, is there extreme heat? Yes, there is extreme heat in a sauna. Are you doing exercise inside?